I have been buying cherries non-stop this Summer. Almost every trip to the grocery store results in at least one bag of cherries. They are a perfect snack, dessert, or filling. Earlier this summer I added fresh cherries to my red, white, and blue pie for Memorial Day. I added them to a batch of sangria for 4th of July. So it only seemed appropriate that I toss them into the chocolate chip scones I made over Labor Day. What a fitting way to bid farewell to the Summer. You would think that after all these cherry baking projects that I would invest in a cherry pitter. I still haven't learned my lesson. I love making scones because they sort of like a fancy biscuit, but they are just as easy as making biscuits. First, cut cold butter into to the flour until it's basically the consistency of gravel. Then stir in the liquid ingredients until it forms a sticky dough. Fold in the cherries and chocolate chips so they are peppered throughout the dough. Then turn the dough out onto a piece of plastic wrap and wrap up into a disc. Pop in the fridge to chill for at least an hour. I promise it will be so much easier to work with if it's chilled. Now, there are several ways you can form a scone. I have made them in wedges (like above) and I have also made them in rounds (like a biscuit). I have also seen them in square form. You can pick whatever shape speaks to you. In this case, I didn't feel like breaking out the rolling pin (the old girl needs a break from rolling out cookie dough) or the biscuit cutter so I took the disc of dough and cut it into 8 wedges. I also sprinkled a little raw sugar on top to give it a little extra crunch. 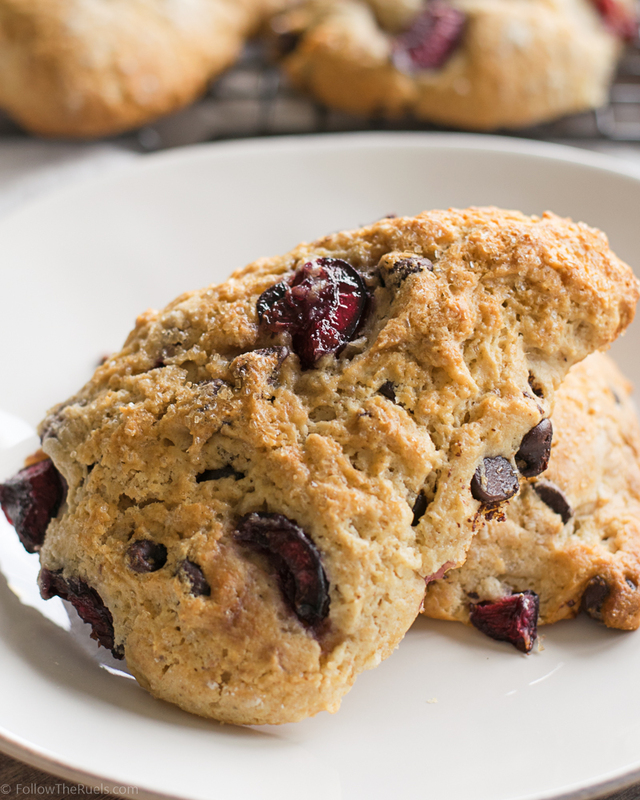 After a few minutes in the oven, the cherry chocolate chip scones should be nice and golden brown; crunchy on the outside, and super soft and steamy on the inside. The cherries will be nice and soft and the chocolate chips will be slightly melted. I recommend eating them shortly after they come out of the oven so that you can split one in half and melt a bit of butter on the inside. It's the way scones are meant to be eaten. I assume. Add in the butter pieces and cut into the flour mixture using a pastry cutter or two knives until it resembles a coarse gravel-like consistency. In a small measuring cup or bowl, mix the milk, egg, and vanilla together. Pour the liquids into the butter and flour mixture. Stir together using a large spoon until the dough completely combined and it forms a loose, tacky ball. 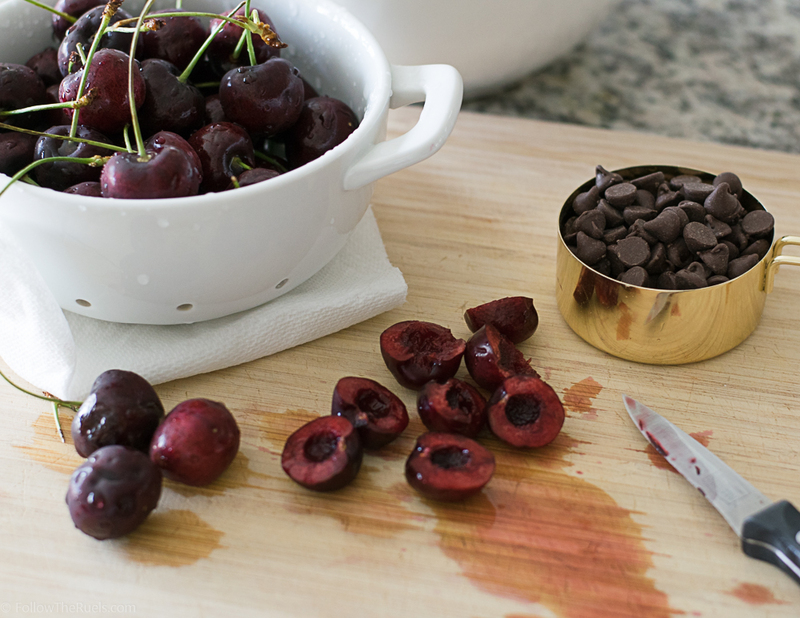 Fold in the chocolate chips and cherries. Turn the dough out on to a large piece of plastic wrap. Wrap up the ball of dough then flatten into a disc. Place in the fridge and let chill for at least an hour. After it has chilled cut into 8 equal sized wedges, or roll out to 1 1/2 inch thick and cut into rounds using a biscuit cutter. Bake at 350 for 15 to 20 minutes, or until golden brown on top.